Want more ideas on how to reuse the wood pallets your pellets and wood bricks are delivered on? You can always re-use empty pellet bags and wood pallets for DIY projects – but what about the shroud that comes wrapped around your pellet delivery? 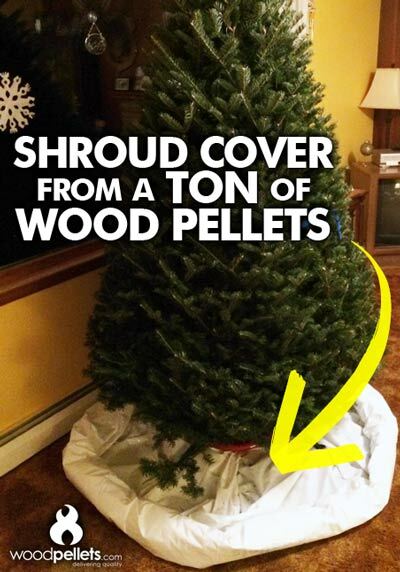 It can come in really handy this time of year. Hauling out the Christmas tree after the holidays can be a messy, arduous task. On top of being repeatedly poked with sharp branches, the dried out needles get absolutely everywhere. With a little tweak ahead of time, you can avoid this headache. Simply position the shroud on the floor where the tree will go, and roll up the sides in order to hide it under the tree skirt. When you’re ready to take the tree out – you’ll have this heavy plastic in place to help. Simply unfurl the shroud up and around the tree to cover and secure it for removal! Do you have wood pallets leftover from a delivery? Don’t be so quick to get rid of them, because there are a variety of ways to reuse wood pallets! 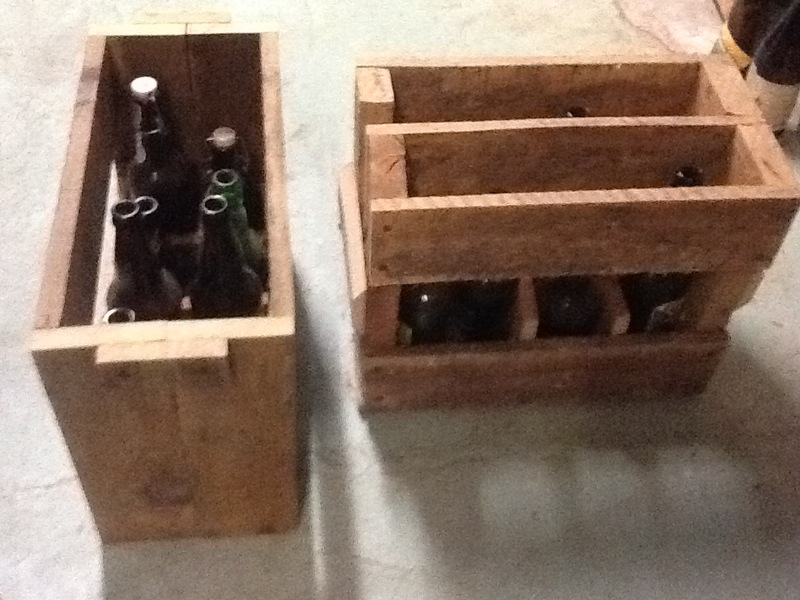 Our most recent pallet DIY project is a wall-mounted bottle opener. It doesn’t take a lot of time or materials, and it’s a great gift idea! Take a look at our video tutorial below to see how it’s done. Depending on how you’d like to install your new bottle opener, there’s one quick final step. You can pre-drill holes to make wall-installation easier, or simply add strong magnets to the back to affix your project on a refrigerator. Wood pallets can be handy to use as-is, too. If you had a bulk wood pellet delivery, and the pallets of fuel weren’t placed inside the garage with a pallet jack, you might consider re-stacking the wood pellet bags inside. 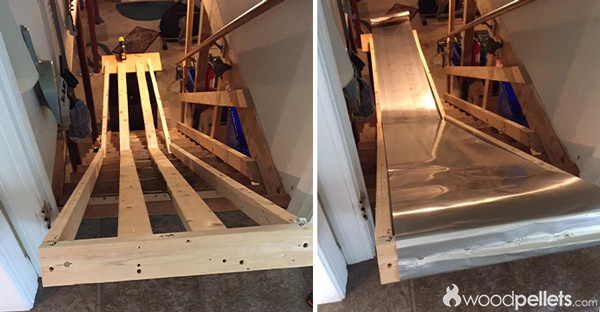 If your space allows it, it’s a good idea to reuse the wood pallets to raise the newly re-stacked bags from the floor, protecting them from potential leaks/flooding. Do you have any wood pallet DIY ideas? Let us know on Facebook! 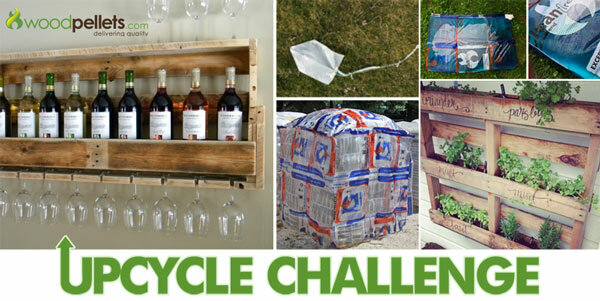 Upcycle Challenge: Win a Free Delivery Voucher! Now that we’re in the final months of the 2017-18 heating season, you might have a pile of empty wood pellet bags and wood pallets around. Do you have pellets set aside that were damaged by water? Here’s why you shouldn’t just throw out water damaged wood pellets. As for the empty bags – if you’d like to try and recycle them, check with your local transfer station to see what the protocol is. The wood pallets your fuel was delivered on could be handy to keep around for re-stacking pellets later, because the bags should never be placed directly on the floor in your storage area. But what if you wanted to “upcycle”, and reuse empty bags and pallets for something new? Clearly there are so many ways to re-use what you might otherwise throw away. All you need is a little creativity, some time and (sometimes) a few tools. Do you have any ideas to share? Let us know on the Woodpellets.com Facebook page! As you probably know, wood pellets turn to sawdust when water is applied, because they absorb moisture immediately and return to the original state of clean wood fiber. 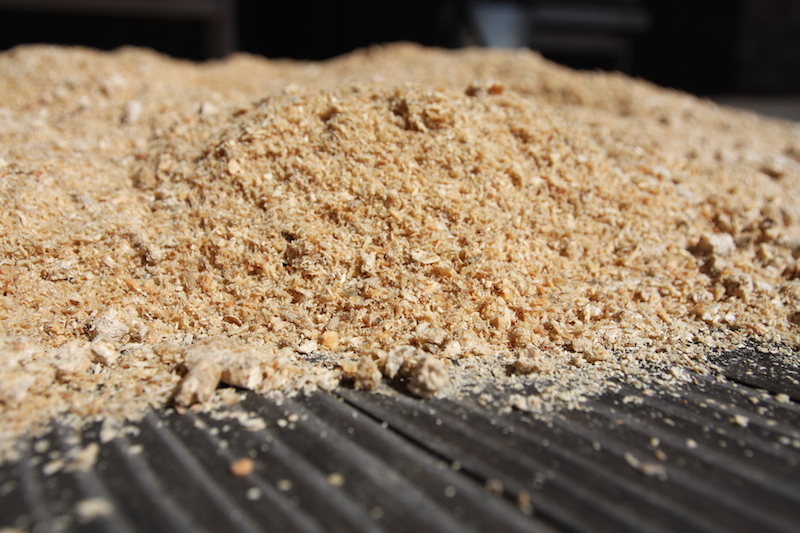 Did you have some packaging damage that let in some snow or rain – and now you have leftover sawdust? Don’t throw it out, because you can put it to good use! Here are some of the ways wood pellets can come in handy – aside from heating. Do you have any pallet reuse projects you’d like to share? We invite you to post them to our Facebook community! Facebook page of how they reuse their pallets and wood pellet bags for a chance to win a free Woodpellets.com delivery voucher. Check out our favorites below!